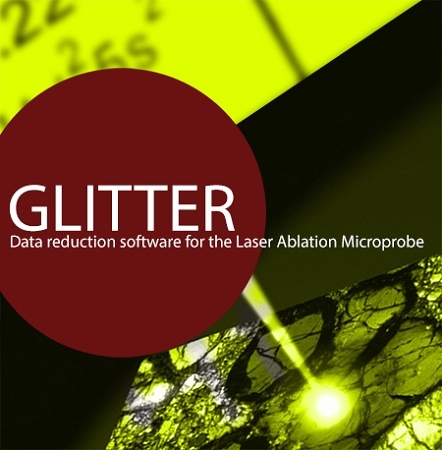 GLITTER is a data reduction software for the laser ablation microprobe, developed by the ARC National Key Centre for Geochemical Evolution and Metallogeny of Continents (GEMOC) and CSIRO Exploration and Mining, to provide simpler, more consistent and faster analysis of LAM-ICPMS (laser ablation microprobe - inductively coupled plasma mass spectrometry) data. GLITTER provides the first real-time interactive data reduction for LAM-ICPMS analysis; it allows inspection and evaluation of each result before the next analysis spot is chosen. GLITTER enables rapid selection of the best intervals for background and signal measurement. Time-resolved data for each analyte mass are displayed in a unique pixel-row display to allow quick recognition of inclusions and data spikes. Results in tables and plots change automatically when different integration intervals are selected. With online analysis it provides calculation of the results for each analysis during the run. The first results are calculated as soon as one standard and one sample have been analysed. With each additional standard analysis, the data are instantaneously adjusted to take account of changes in the analytical conditions such as instrumental drift; no off-line reprocessing is required.